Welcome to the new and improved DocPop.org. I’ve had this idea for a site redesign for a while, but finally got it implemented thanks to the hard work of Naomi Most. The old site was a single 420 pxl column (no sidebars) with a huge rotating banner that pushed the blog content off the page. The new site has a much shorter header, wider columns and a sidebar with widgets. Overview: I tried to make the new site feel like you were looking on my art table in my office. Paperclips, handwritten messages on the backs of receipts, and art scrawled in the corners of ripped pages from old paperbacks. The top banner automatically rotates with each page refresh (go ahead, try it out… I’ll wait). The image icon on the top right rotates every half hour. There are currently 12 headers and 30 icons, but I hope to keep adding more each month. Maybe even adding submissions from friends and readers into the pool. About the paperclipped icon: This is a rotating image too, but instead of switching with each refresh, this icon only changes every 30 minutes. The main reasoning for this was to keep people from seeing the whole pool by just click refresh all the time, but I also thought it would save on loading time from page to page. This way they will hopefully see a different image with each visit. Most of these papercliped images are self portraits or photos of myself, but some are tangentially related (such as paintings I did or photos of yo-yos etc). If anyone wants to create any “DocPop” portraits, I’d be glad to add them to the pool. About the sidebar: I love Google Reader… not just for reading my RSS feeds but also for the note sharing and social aspects of sharing and commenting on my friends shared articles. Adding link to my Google Reader Shared page was actually one of the main factors that finally got me to redesign my site! Links to Twitter, Flickr, my band, and everything else area given, but that side bar’s primary function is to promote those shared links. BTW, the font used in the header links and side bars links is my Hellavetica font. 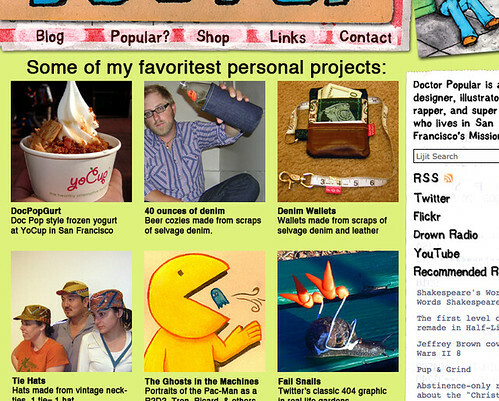 About this column: My old blog was only 420 pixels wide. So glad to finally have an extra 136 pixels to play with. Should make reading comics easier from blog posts. About the shop: It’s fully functional now! I just added a lot of goodies like leather pen wraps and wallets. About the contact page: I love this gag. If you click the image, it takes you to a captcha protected email link. Thanks again to Naomi for her work on the new site, Bill for his work on the old one, and as always to my midwestern BFF Schalicto for hosting the site. Tonight I’ll be having a “site launch” party at Benders at 7pm. Come join me and friends as we dine on sushi at my favorite bar.